Jersey’s best kept secret by far, Les Ecrehous is a tiny archipelago of islets located some six miles off the north east corner of Jersey. Its beauty is breathtaking and special moments are to be had all year-round, from stunning sunrises over France and sunsets over Jersey, to the sight of dolphins accompanying you all the way there. LesEcrehous can only be reached by boat and nobody lives there permanently, but a few stone huts and houses are used as weekend or holiday hideaways by a few lucky islanders. Visitors are welcome for the day. Imagine a world of golden sand, crystal clear water and rock, where fish and birds are able to live at peace with the rhythm of the tide. Les Ecrehous are just that and in 2005 became a Ramsar site, protecting the habitats of many species. Birds, including migratory species, are plentiful. There is a recommended code of conduct for visitors, allowing birds’ breeding season to go on without disruption. Fishing is normally exciting as the area acts as a nursery. Line catching a sea bass from one of the islands’ shores will be a highlight for many a keen fisherman as celebrity chef Rick Stein has already discovered! Amongst the most recognised species, you will be able to spot bottlednosed and common dolphins, atlantic grey seals and basking sharks in the water, as well as terns, oyster catchers and herring gulls on the land. As with any prized destination, getting to Les Ecrehous requires a little planning. The tidal range is enormous, with navigation and judgement of the currents better left to professionals. Although many boat charters are available from ‘mainland’ Jersey, it is strongly advisable to have a local skipper on board. For an exhilarating trip across, get in contact with Seafaris who specialises in R.I.B trips to Jersey’s otherwise inaccessible coastal treasures. Not only can they deliver a fast and safe approach to Les Ecrehous but the team have an excellent knowledge and huge respect for the wildlife and the environment that you will discover. Once there you will be able to go swimming, kayaking, paddle boarding, picnicking, walking, fishing and sunbathing. Les Ecrehous or Les Ecrehou? ‘S’ or ‘no S’ is one of the questions that the quirky Ecrehou Residents Association is asking itself. The islands are looked after by this passionate group of Jersey men and women whose families have for generations owned the cluster of small fishing houses found on the main island or the Maîtr’Île. The spelling of the name is by no means their only concern. Les Ecrehous is a place of incredible beauty and fragility and will only remain so if visitor numbers and behaviour are kept in check. Maintaining the houses and positioning the moorings are part of their duties when they are not fishing or having a sundowner in a truly special place. 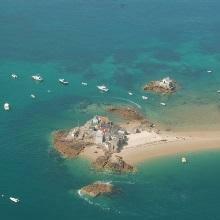 This entry was posted in Jersey Activities, Places to Visit and tagged Les Ecrehous. Bookmark the permalink.